Bot Thoughts: AVC Planning with SHARC! SHARC (our local robot club) had an awesome AVC planning meeting Sunday at Deep Space in Parker. 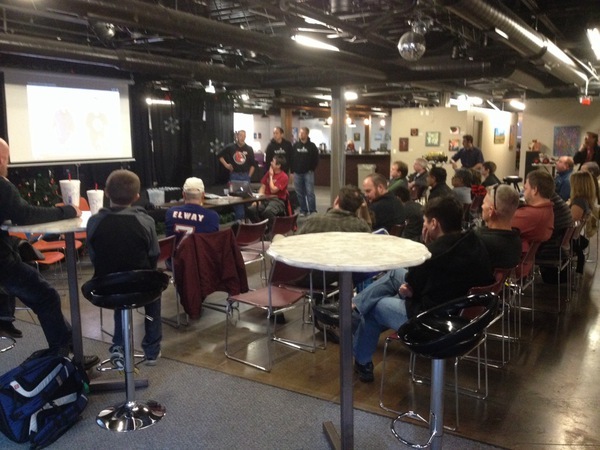 Big thanks to Sparkfun for talk and pizza and RoboRealm for paying our meeting fees! AVC? The annual Sparkfun Autonomous Vehicle Competition. Air and Ground vehicles compete in a fully autonomous race, drawing competitors from around the globe and thousands of spectators. Sparkfun presented on the AVC, Scott Harris (2 time AVC winner) and I did an impromptu talk about our robots, and everyone was jazzed about the AVC. Then SHARC founder George announced our top secret AVC entry. It's going to be huge! We have a number of very smart folks signed up to help. But, it's a little too early to reveal the secret. If all goes well I'll do so later. If you want to find out what we're planning, subscribe to this blog's RSS feed. Meanwhile I'm continuing to work on my own AVC entry, Data Bus, for 2014.